Jazz Bashara lives on Artemis, the one and only colony on the moon in late 2080's. Small time smuggler, she has big plans to save up some money, pass her license to become an EVA Master, and get out of the tiny cramped room she rents and into a room that she can actually stand up in. Not asking too much right? When the job of a lifetime comes her way with a top payout of 1 million slugs (Artemis currency) she can't pass up the opportunity, even though it's absolutely insane. Jazz soon finds herself embroiled in a life and death conspiracy with dueling parties warring for economic and political control of Artemis, and if she isn't careful she may wind up dead, or worse... deported. I have been a fan of Weir since his smash hit, The Martian, and if it's even possible, I think I enjoyed Artemis even more. 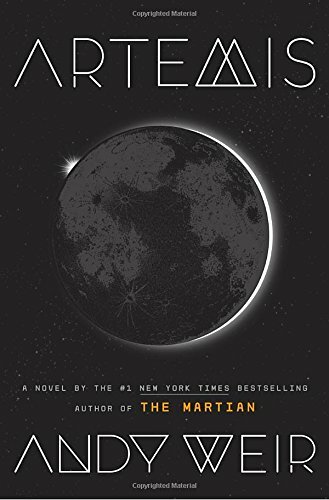 This book is action packed from literally the first scene to the last and bursting with all that science-y stuff we all loved from The Martian. I feel like we readers deserve an honorary chemistry/physics degree just from reading. Weir has this insane way of making this stuff fun and exciting....like heart stopping/jump out of your chair/ biting your nails exciting. He is a true master storyteller for sure. Jazz was clever, witty, brash, and smart as hell; I basically want to be her best friend. All the supporting characters were fantastic, as were their individual dynamics with Jazz. Each one definitely contributed in their own way not only to the plot progression, but to Jazz's identity and personal development throughout the novel. (Svoboda was hands down my favorite, I wonder if Jazz ever did test that new product he developed... I want to say she did....wink wink). Absolutely fantastic book, can't recommend it enough. Weir has forever earned himself a place on my auto-buy list! GET YOUR OWN COPY ON AMAZON BY CLICKING HERE!